I'm on a job where some folks are attempting to use aluminum plates to separate weld power cables from ethernet/serial comm. To be clear, it's just wires in a cable tray separated by an aluminum plate. Not fully enclosed. Based on the relative permeability of Aluminum, I believe this to be a worthless idea, unless a full Faraday cage is made. Am I correct in believing we would need to use a high permeability material to be an effective shield? 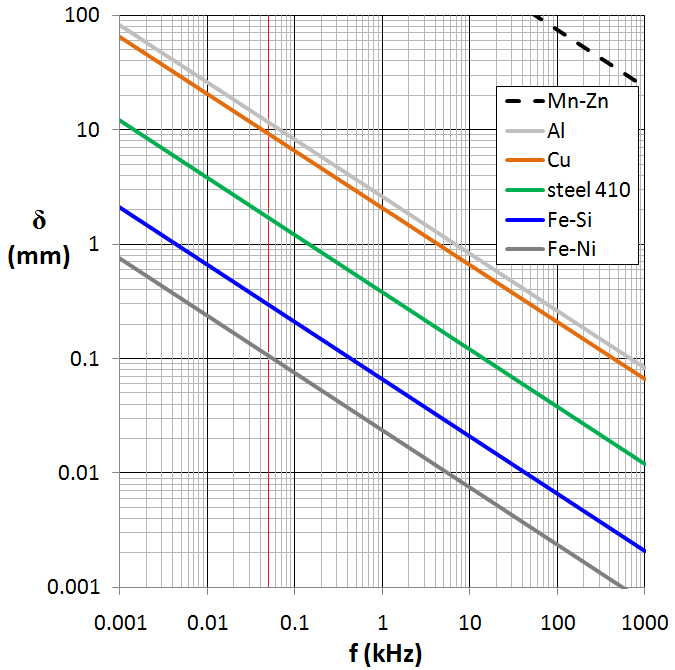 An aluminium plate would be good against electric field emissions and here I'm talking medium to high frequencies. So maybe there are some nasty voltage spikes (switchgear or loads) influencing the cable. The electric fields can be strong but are easily disposed of because of their relative high impedance. It's always better to earth the shield too. The vertical red line is at 50 Hz and, as can be seen, the skin depth at 50 Hz is about 10mm. So, if it's just basic AC magnetic fields then a 10mm plate would be a good start. Clearly a 1mm plate will start to have a benefit at about 10 kHz so, if the H field is 10 kHz or greater 1mm plate will do. Why not use steel? This seems likely to be the best most practical material at 50 Hz but basically without analysing the interference it's hard to say for definite. I remember similar approach being done at my workplace few years ago. However, the correct thing to do is weld the plate fully and ensure that the two cable sections are fully isolated. Also you need to use EMI/EMC shielding gaskets along the door if its applicable. Since in your case it's a cable tray open to interference, the plate alone won't do it. Ensure that the cables have shields on them and it's grounded correctly. Not the answer you're looking for? Browse other questions tagged shielding materials or ask your own question. What properties of metal makes make them suitable as EMF shielding material?